Evan Jonigkeit portrays Captain Chesterfield in the Frontier TV show. The show narrates the battle for wealth and power in 18th century Canada fur trade. Captain Chesterfield is an accomplished soldier, whose ambition is to ascend to the governorship of Fort James and make his mark in the New World. 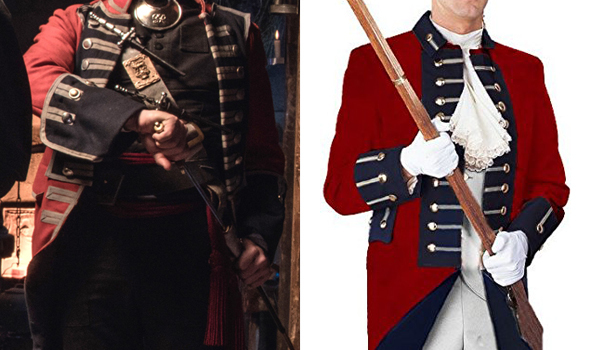 The coat that Evan Jonigkeit wears in Frontier for his Captain Chesterfield role is a British revolutionary red coat inspired by the 18th century military uniform. 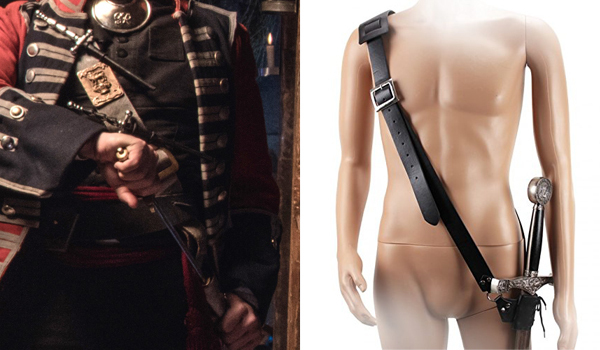 The belt that Evan Jonigkeit wears in Frontier for his Captain Chesterfield role is a kind of Sam Browne belt with a thicker chest strap. You probably already have a standard belt, so just add this sword belt to your outfit and it will look just like Captain Chesterfield's belt. 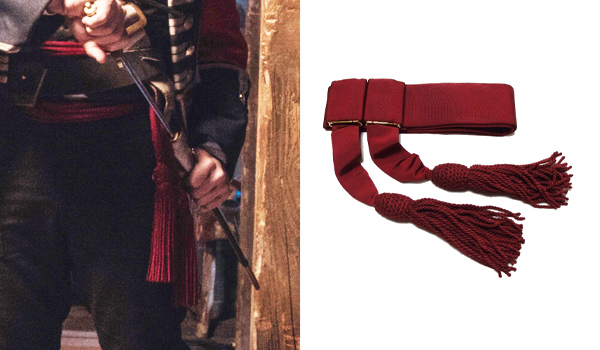 The textile "belt" that Evan Jonigkeit wears in Frontier for his Captain Chesterfield role is called a waist sash, it is red and has two tassels in accordance with the british officer uniform of the time. 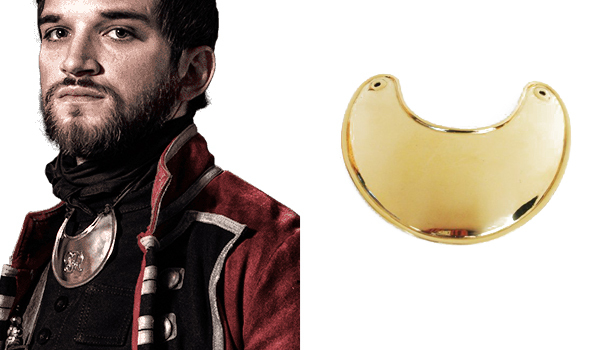 The necklace that Evan Jonigkeit wears in Frontier for his Captain Chesterfield role is actually called a gorget and has "GR" engraved. It is the cypher of George III or George IV, kings of the United Kingdom. The shirt that Evan Jonigkeit wears in Frontier for his Captain Chesterfield role is a black dress shirt, while his pants seem to be dark jeans with a blue tint. You probably already have those items, but if you need more check out these affordable and high quality shirt and pants. 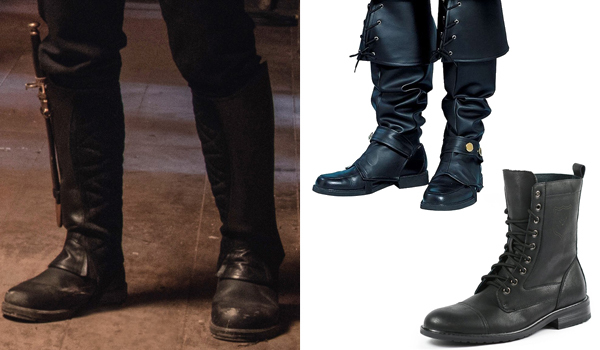 The boots that Evan Jonigkeit wears in Frontier for his Captain Chesterfield role are classic black leather boots. 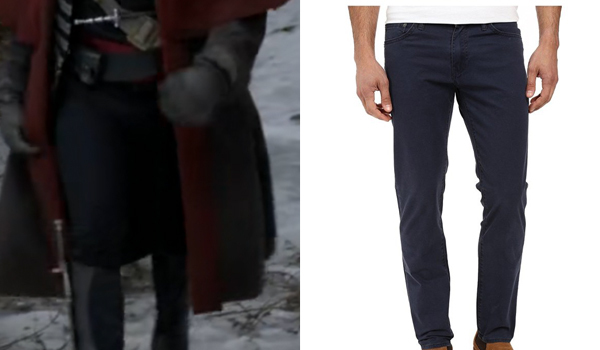 Captain Chesterfield also wears boots tops. Captain Chesterfield always has on him three small daggers (Misericorde daggers) and a long thin sword, called a rapier. 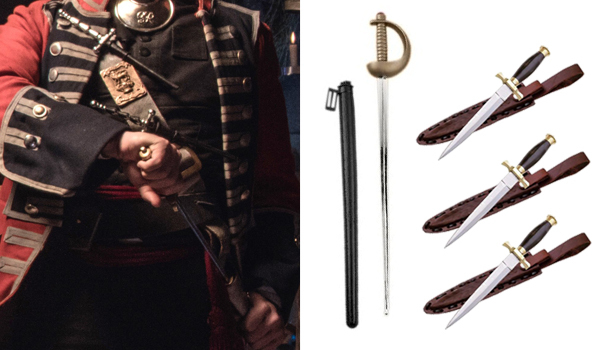 Two of the daggers are set on the chest strap, while the last one is on his right boot. This dagger comes with a leather sheath that you can sew on the boot tops, just like in the show. The rapier is hanging in the chest holster at his left.